Icheon is a city in Gyeonggi Province, South Korea. (It should not be confused with the much larger Incheon Metropolitan City.) Together with Yeoju, Icheon is known as a center of South Korean ceramic manufacturing and is a UNESCO City of Crafts and Folk Art. The Icheon Ceramics Village features 300-plus ceramics-making firms in the area of Sugwang-ri, Sindun-myeon, Saeum-dong, and is a popular visitor attraction. They use traditional skills and produce porcelains in some 40 traditional firewood kilns. This pottery is recognized both at home and abroad for its quality. The Saeum-dong and Sindun-myeon areas also include a ceramics village with many ceramics stores. Potters have researched traditional methods and revived the manufacture of ceramics in the style of Goryeo celadon and Joseon white porcelain here. The village is the center of the effort to preserve these traditions. We will visit some famous kilns to see some time-honored traditions at work. Traditionally, the important ingredients in making porcelain were good quality kaolin and large quantities of firewood. Kaolin was only found in some areas of the country, and the best kaolin close to the capital was found around Gwangju, Gyeonggi-do. There were also heavily wooded areas nearby, and the Han River provided a transportation route for moving raw materials to the kilns and finished products to the capital and beyond, so the nearby town of Icheon became the production center for much of Korea's most famous porcelain. First, we will stop at the kiln of Mr. Ji Soo Ku, who operates a rare traditional wood fired kiln. 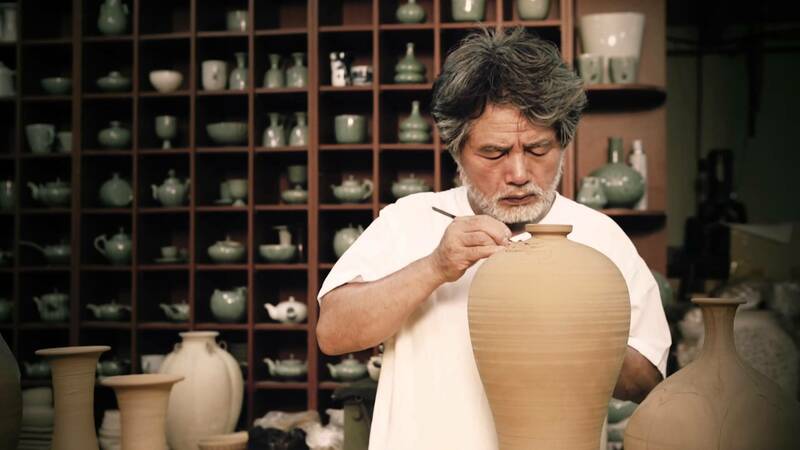 Mr. Chi's late father, Ji Sun Taik, was a famous master potter whose works are extremely valuable, and the younger Mr. Chi is continuing the family tradition. Then, we will stop at the kiln of Mr. Kim Jongmook where we will take a look at the process of pottery making. Next, we will go to a potter's village, visiting the traditional kiln of Mr. Im Hang Taek, well known for white porcelain. Also, we will visit other shops nearby and we will have a chance to see interesting designs of porcelains. From here, we will go to the studio of Mr. Kim Se Ryong, known for his blue porcelain and his unique carving and cutting techniques. Nothing is more Korean than kimchi, and kimchi pots are an integral part of any Korean household. These jars come in a variety of sizes and shapes, and today we will visit stores where we can buy onggi (kimchi jars) with a unique traditional design. Changes in the itinerary may have to be made due to time considerations, at the discretion of the tour leader. 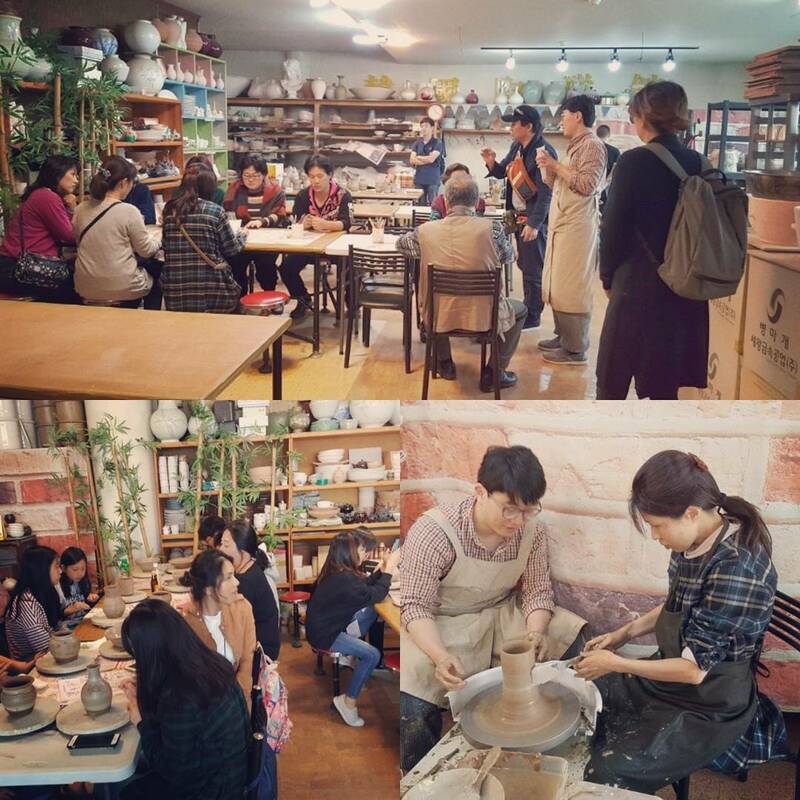 Besides visiting two famous pottery studios, we will receive instruction on the basics of pottery making, followed by an optional hands-on experience. Our creations - hand-decorated coffee mugs or hand-crafted flower vases - will be afterwards fired and then shipped to our homes. Our bus will leave at 8:30 a.m. Saturday, from the Yongsan Post Office (Subway, Line number 4, blue line, Sinyongsan Station #429, exit #1). The return is slated for Sunday around 6:30 p.m. The cost of the excursion includes transportation, but not meals and beverages. * The optional pottery experience costs an additional W20,000. * Optional pottery class, including materials with shipping, costs an additional W20,000. Prior reservation is required on your RSVP signup form. Meals and beverages are not included in this excursion's fees. 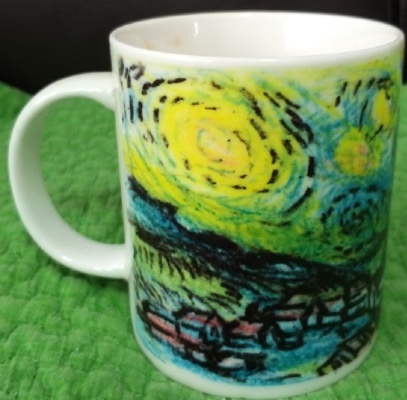 Guide Sue Bae hand painted this cup during a prior visit! To register your required RSVP, simply click here by Wednesday, September 5.